Today I went to a birthday party for the daughter of an old friend. One of the gifts was a Twister game, and after the kids had played with it the adults took a turn. It ended up being a draw between me and my friend Mia, and Mia’s husband snapped a pic of the heated final round with his iPhone. Within minutes the pic was up on Facebook. Modern life is like one big reality tv show where everyone is part of the cast and the audience at the same time. I sorta love that. Yup! It’s fun to be able to share one of the lighter moments of life with all. Of course it also rocks that I won!!! That was a great night. The game was so much fun. 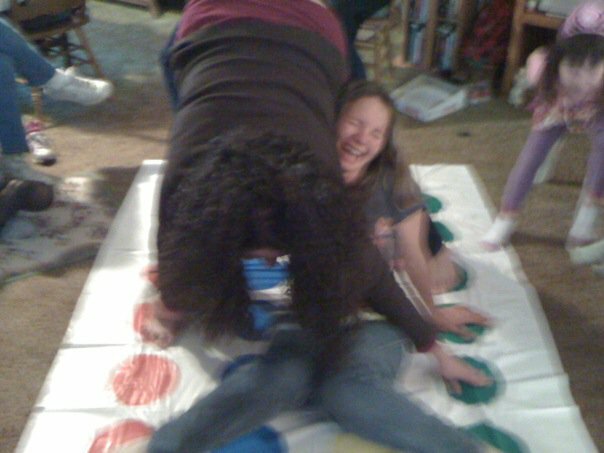 My first time playing twister also. Mia — AHEM! I collapsed because you TICKLED me, and you couldn’t have done that without taking one hand off of a spot! I call that a draw! Actually since Mia Removed her hand fomr the spot prior to your colapse, even though she was being told to move it to another spot, I still say she lost. I don’t think you can purposely touch another person with the intent to make them fall. Going to go check the rules now. uh oh I just read the rules and there is nothing in the rules that says you can not touch, push, or tickle a person to win. Sorry my friend. BTW Mia likes to cheat. LOL! No worries, I had a blast. I may have to buy that game for my kids, although I fear Luke may get squashed flat playing with me and Elizabeth.